The Service League was honored by the Eddie and Jo Allison Smith Family Foundation with a $2,500 grant this past month. The Smith Family Foundation is celebrating their 25th anniversary this year and recognizing the Service League as a partnership in giving back to the community. The Service League is immensely appreciative for this grant from the Smith Family Foundation. The funds will be appropriated to a project that will benefit the local community. I met Hamilton, a therapy dog at the cancer center, and his owner Brittany. 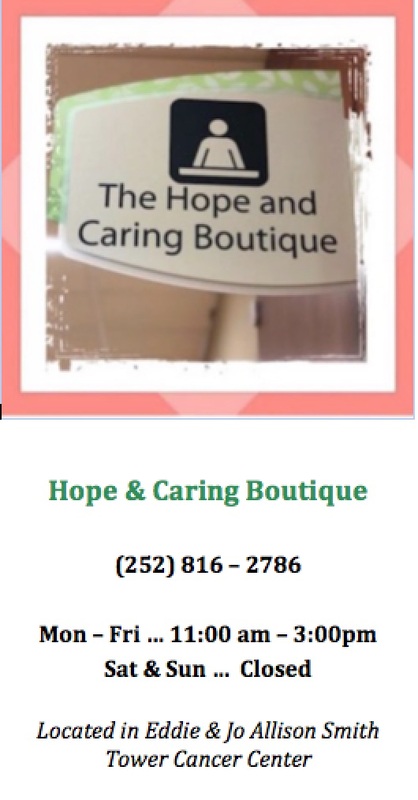 They stopped by to see our Hope & Caring Boutique. Hamilton is such a great therapy dog. He is deaf and only has one eye. He is a Great Dane and is 6 years old. There are about 6 therapy dogs that they (recreational therapy department) use at the cancer center. 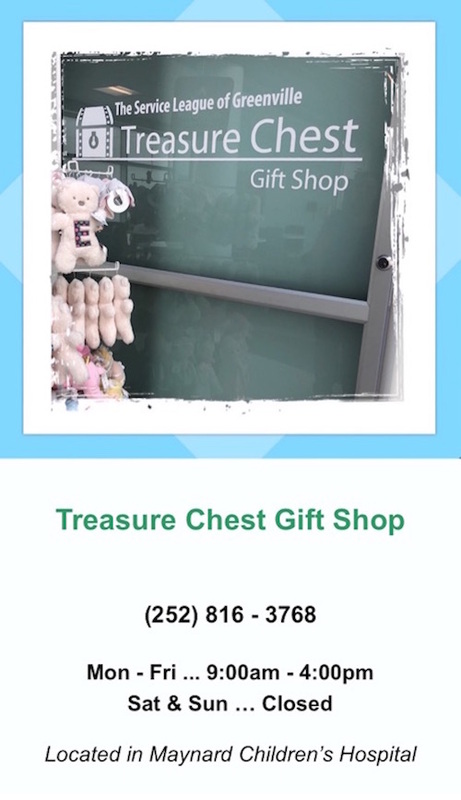 I loved the picture they took because it has the outside of the shop and the shop plaque above us… I just loved that dog! Back in March, The Daily Reflector did a wonderful article on Brittany Dail and Hamilton highlighting their therapy work and efforts to educate others about responsible pet ownership and special needs pets. A huge Service League of Greenville thank you to Brittany and Hamilton for their amazing service to our community by bringing comfort and joy to patients and helping to make pet ownership better for pets and people. It is with great pride and honor that The Service League of Greenville announces its sponsorship of military women attending the 2018 Military Women’s Health Symposium. The interdisciplinary conference is to raise awareness of the unique health needs of active duty and veteran women and to improve care by updating providers on best practices in screening, prevention, and intervention of health conditions specific to military women. It is a combined effort by Vidant, the VA, EAHEC and Duke AHEC. And, what better way for our new SLG President, Ann Taylor, to start her two year term, then with a $5,000 donation from The Service League of Greenville to 2018 Military Women’s Health Symposium. The funds will help cover the meals and ticket costs for veteran and active-duty military women. Pictured above (l to r): Todd Thompson, Vidant Vets Committee; Ann Taylor, President, Service League of Greenville: Karen Goble, Assistant Director of Continuing Medical, Dental and Pharmacy Education, EAHEC; Dr. Janice Busher, Women’s Health Care Provider, Greenville VA: Patricia K Grabania, Women’s Health Coordinator, Greenville VA.
As we continues to celebrate our 80th year, it is inspiring to know The Service League of Greenville is still finding opportunities to serve our community in new ways. Our beautifully worded greeting at the entrance to the healing garden speaks to the Service League of Greenville’s commitment to the health and wellness of our community. Enjoy many more pictures of the Service League of Greenville, healing gardens and Cancer Center at jennifarrow.com. The Service League of Greenville was also honored by a lovely THANK YOU cake from Vidant Health Foundation at our May general meeting delivered by Blaire Vick, Event Coordinator along with Bobbie Lapiejko, Director Annual Giving and Crystal Corbett, Major Gift Officer. Our own, Martha Bloss, Hospice House chairman for The Service League of Greenville was honored for her outstanding volunteer work with The Service League of Greenville Inpatient Hospice. Angelina Brittle, Hospice Social Worker and Volunteer Coordinator & Martha Bloss, Hospice House Chairman, The Service League of Greenville. The hospice house cares for patients who have pain or other symptoms that are hard to manage at home. The eight-bed facility offers medical care in a home-like environment and allows hospice patients and family members to be together. Service League members who volunteer there provide non-medical support and are specially trained to assist at the front desk and to read to patients. Non-trained Service League members bake treats and take meals during the holidays for patients’ families and visitors. The American Cancer Society’s McConnell-Raab Hope Lodge is a temporary “home away from home” for cancer patients to stay while they are going through cancer treatments in Greenville. Since its doors opened in 2002, The Service League of Greenville has provided strong service support for the Hope Lodge. Our own Brenda Edwards was the first to greet guest when the doors opened in 2002 and she has been a dedicated volunteer ever since. Most weekdays there is a Service League member working the front reception desk greeting guests and answering phones. We also help with set-up and clean-up during special events, and many members drop off homemade desserts or hearty dishs for guests to enjoy during their stay and are especially welcome during holidays. Service League of Greenville members gave nearly 200 hours of service to Hope Lodge in the month of April. 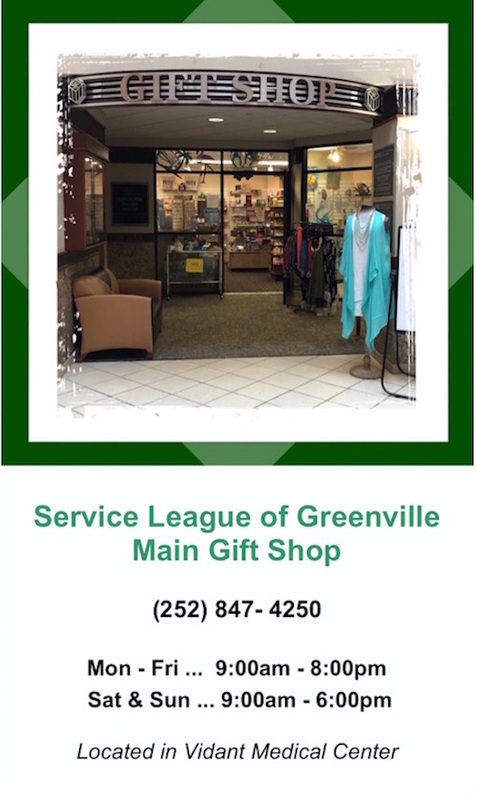 A big THANK YOU to all the members of the Service League of Greenville for their many hours of service and their many YEARS of service. We are so very grateful for your support in our mission to offer temporary housing when guests receive cancer treatment in our area. The dessert selection at our event was the tastiest, most delightful we’ve ever served. Hope Lodge chair Betty LeRoux, along with Cassie Causey and Donna Moore, accepted the award on behalf of all Service League of Greenville members. We’d like to add our thanks to all our members for their ongoing dedication and support of Hope Lodge. And, a special SLG THANK YOU to Katrina Combs and the American Cancer Society for providing such a warm and welcoming “home away from home” to cancer patients visiting our community.